Cool versions of crap cars are always an enigma. Today’s Nice Price or Crack Pipe Citation X-11 is just such a car, and it’ll be up to you to unravel the mystery of both its desirability and its price. According to its seller, last Friday’s 1978 Mazda RX-7 sat unused in a garage for more than a decade. I wonder what it dreamt about all those years? A lot of you managed to find it dreamy at its four-grand asking, a fact evidenced in both the comments and the vote, with the little Wankel-er coming away with a solid 84-percent Nice Price win. Nicolas Cage is an Oscar® winning actor. It should be pointed out however that in addition to his award-winning work, he’s also long had a penchant for appearing in some of the worst mainstream crap ever committed to celluloid. In between those two extremes he makes National Treasure movies. One hopes that he makes another one of those very soon. I bring up Cage’s incongruously uneven canon as evidence of the natural hit or miss nature of any person’s or organization’s output. I think it has something to do with Chaos Theory or something. You could easily lump Chevy in with Cage in the list of those who have had great success but who have also on occasion phoned it in. Over the decades the Bow Tie Boys have released legends like the SS Chevelle, 1969 Camaro Z28 and the 427 Corvette. In those same years they’ve also foisted off on a car buying public less well received fare such as the Corvair, Vega, and the subject of today’s discussion, the Citation. 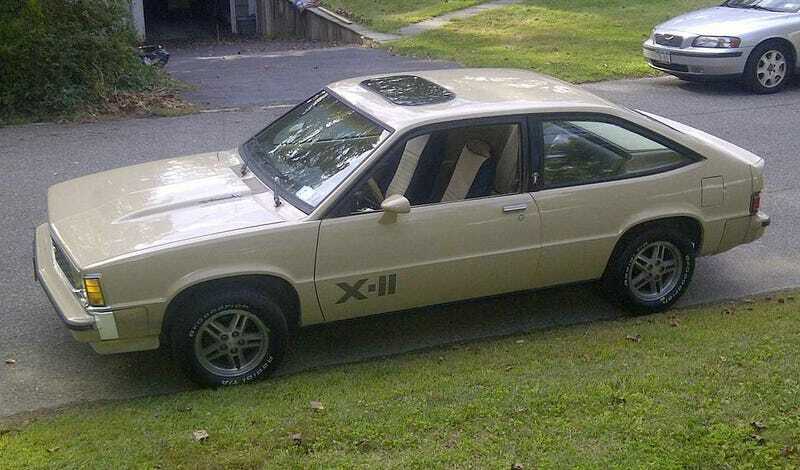 The X-body was GM’s first American FWD platform with a transverse engine and transmission, and like most first attempts at anything, GM didn’t quite hit the mark with it. The FWD X-platform suffered from a number of teething issues in its early years including serious braking problems that resulted in lawsuits, recalls, and the anointment of the platform in the public’s eye as a turd. By the time of this 1981 three-door was built most of the safety issues had already been ironed out by GM. Unfortunately, the Citation’s other major problem, a distinct lack of driver engagement remained. That was somewhat cured by the X-11 model, a sporting package that in ‘81 included a “High-Output” version of the 2.8-litre pushrod V6, F-41 suspension, alloy wheels, and, in this car’s case, a four-speed manual. Be aware that the H.O. motor produced 135-bhp, a twenty-pony bump over the regular-output V6 but not all that towering. “High” in this case was subjective. With the stick however, these cars could do sixty from a standstill in around eight and a half seconds, which wasn’t bad for the era. This is probably the nicest X-11 around, so nice in fact that it appeared in a New York Times (Fake News!) article and was used in a episode of the TV show The Blacklist. The seller says that the car is unmolested, however that’s not to say it’s all original. The ad notes that the beige (how apropos!) paint received a respray a decade back, and a hole has been punched in the roof for one of those pop-out sunroofs that were once oh-so popular. You’ll note that it wears louvers on its hatch in a couple of the pics, but apparently those don’t come with the car unless you pay extra. What does come with it is a “professionally rebuilt” engine, new brakes and rear shocks and an interior that’s claimed to be rip-free and in reasonable shape. Plus there’s a crotch cooler in there which is a major plus for those who may suffer from Swamp Nut Syndrome. Mileage goes undisclosed in the ad but with a rebuilt mill and decent overall appearance, does it really matter with a car like this? I mean, you wouldn’t be buying it to send a kid off to college in, or as a daily driver for your burgeoning career in the cutthroat pizza delivery business. It should be noted that while the X-11 is to the base Citation what the Ur GTI was to the original Rabbit, the Chevy was not quite so successful nor venerated a transformation. Still, it is the best of all Citation models, and for the Chevy enthusiast it could be an interesting and—if you so deem it to be—low cost entry into the marque. That cost is $3,950, and remember that’s without the louvers. What’s your take on this best of the worst and that price? Does that make this a Citation that you would make? Or, does that price mean that X-11 does not mark the spot? For $4,000, Could This Well-Rested 1978 Mazda RX-7 GS Be The Rx For What Ails Ya?